But now we know. We know that, after the first 63 minutes were his, Rafael Nadal was invincible. He started jumping, lunging, fist-pumping. Vamos! reverberated throughout Stade Roland Garros. Head-to-head, Rafa has won 17 of the 25 occasions that he and Roger have played. At the French Open, the record is 5-0 (including four in the Finals). On clay, it’s 11-2; hard-court, 4-all; on grass, Roger leads 2-1. And the most telling of all statistics: in Grand Slam finals, Rafa owns a 6-2 winning edge. 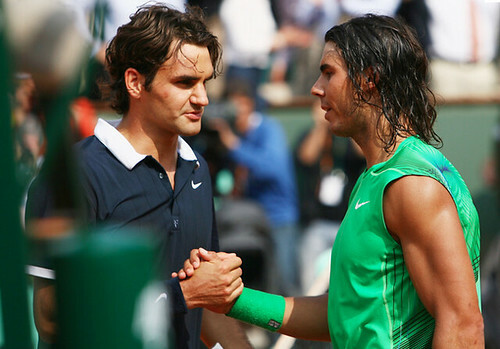 One, the Roger v. Rafa Rivalry is one of sport’s most compelling. No other one-two contest (Borg-McEnroe, Ali-Frazier, Palmer-Nicklaus) can compare. The contrast in personalities. The styles and spins of play. The emotions: cool vs. combative. These are incomparable. And a message to all tennis fans that, should one have the resources, they ought to watch them play “live” before they retire. Two, on court, if it’s Rafa’s forehand against Roger’s backhand, the outcome is as obvious as Pacquiao-Marquez III. The lefty wins. Roger has to find a way to avoid such ping-pong, cross-court exchanges. Three, the tenacity of the Spaniard is unfathomable. His doggedness, resolve, and fortitude — more than his whipping forehand topspin or 100-meter-dash speed — gifts him victory. Tennis is mental. He who grits his teeth harder and wants it more pockets the $1.7 million prize money. Four, defense wins the game. Watch the NBA. Listen to Coach Yayoy Alcoseba and to LeBron James & Co. “Defense is the key to success,” they’ll voice out in unison. Same with tennis. Nadal’s retrieval prowess — his ability to return a shot that, to anybody else on the ATP Tour, would have been a point lost — makes him greater than Bjorn Borg on clay. Five, Roger is only 29. Which means he’s not 30 – a “psychological barrier” age when tennis pros (who’ve played since six years old) are on decline. Seven… his body doesn’t complain. No body is subjected to more excruciating torture than Rafa’s 188-lb. frame. He slides, stretches, smashes, swings, sprints… suffers. Injury can derail his pursuit more than Federer Express. Nine, had Rafa faced Novak in the finals, he’d have lost. I think so. Roger’s backhand is his weakness. Not Novak. His two-handed shot causes grief to Rafa. That’s what caused defeat to the Mallorcan in the last four Final meetings they had. 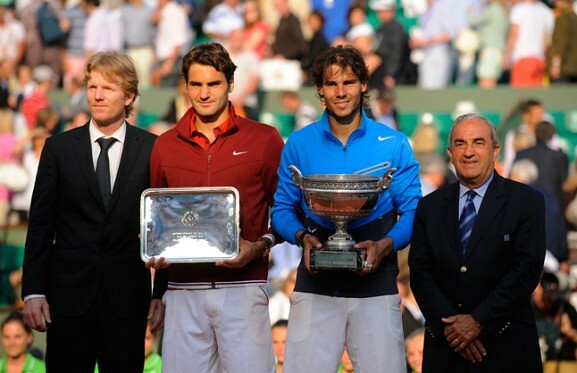 Ten, I can’t wait for Wimbledon…..
A funny thing happened in this 2011 French Open. Everybody forgot about Roger Federer. All the focus was on Mr. Djokovic. All the talk was on Rafa’s quest for a sixth trophy. Who’s Roger? Is he still alive? In this planet? Playing tennis? Well, he happens to be the only living (and, yes, non-living) male person to have won 16 Grand Slam singles titles. He won on the Parisian red clay in 2009. He won an Olympic doubles gold medal in 2010. He is, almost unanimously, the best hairy, male player who’s gripped a tennis racket. And, during the past two weeks in Paris, like a stealth bomber that’s hidden from the radar view, he was silent, unseen, moving, targeting, and now, all of a sudden, he’s out in the open, in the Finals, and within sight of the prize. Less pressure. Compared to Rafa and Novak, the Swiss had it easier. He’s relegated to a world ranking of # 3. That’s a lowly position that RF had not stooped down to since, when, 2002? Yet, all this is working for the good. For Roger’s good. Because elite, world’s-best athletes need an extra boost of motivation to allow them to climb beyond Mount Everest’s peak – and this is it for Roger. Neglected, ignored and, yes, disregarded as a 30-year-old (in August 8) has-been former-superstar whose star has faded, this abandonment Roger is using to spark himself. COME ON!!!!!!! I’ve never, in over eight years of observation, seen him pump his fist and shout “Come On!” as many times as now. He’s feeding off this omission by the media — myself included — and using it to power his smash. You think I’m gone? I’ll prove you people wrong! he’s mentally saying. Did you see his annihilation of Novak? He served 18 aces. He fired his forehand down-the-line. He snapped his backhand cross-court. He gracefully performed drop shots. He attacked. He was unafraid to exchange shot versus shot against the Serb. “I really wanted to make it as physical as possible,” which I was able to make happen,” said Roger. Because of RF’s win, the happiest man in Paris today is… Rafa… the arch-rival but best friend of Roger (you should see their YouTube video, giggling and joking for endless minutes while filming an advertisement). Had Djokovic entered the finals, he’d have been world No.1 when the new ATP rankings are released tomorrow, Monday. Roger prevented that. And he did so during Rafa’s 25th birthday last Friday. Best friends help each other. Roger did his part. Will Rafa return the favor, losing to his similar 6-foot-1, Nike-fully-clothed amigo in tonight’s Grand Finale (at 9 P.M., PHL time)? My pick? I’ve always attempted to stand on neutral ground when these two play. Roger is an exquisite, Swiss-cool, one-handed-backhand-hitting, effortless, injury-less gentleman. Rafa is animalistic, bull-like, tenacious-beyond-compare, humble yet ferocious. The two — apart from having collected 21 of the last 24 Grand Slam singles titles since 2005 — also share a loftier accolade: they are two of the most courteous, good-mannered role models in entertainment. So I pick… “R.” Once, in a Casino Español luncheon with Frank Malilong on one side as Rafa’s Cebu-based attorney and Moya Jackson, Chinggay Utzurrum and Michelle So on the opposite end as I’m-In-Love-With-Roger lifetime members, it was a cross-fire worse than Mayweather, Sr. and Freddie Roach. Seriously, as inspired as Roger is by his twin daughters, I’d pick RN. A winner in 44 out of 45 matches in Roland Garros, he’ll add a sixth crown past 12 midnight tonight. Vamos. Novak Djokovic is the world’s No.1 player. Unofficially. Because based on the ATP rankings, he is No. 2, having recently supplanted Roger Federer. The numero uno is still Rafael Nadal. But, in my tennis book, given that Novak sports an 18-0 record this 2011 and due to his twin wins over Roger (in the Indian Wells semis) and Rafa (finals), then he, rightfully, deserves to be the Top Gun. Rafa? He’s got plenty of points to defend in the upcoming clay-court season. If he loses some matches–and Novak wins a few more–they can exchange positions. Novak will be on top. But the problem (to his opponents) is this: Rafa hardly loses on clay. In the opinion of many, including mine, he is the greatest ever on that slow court. 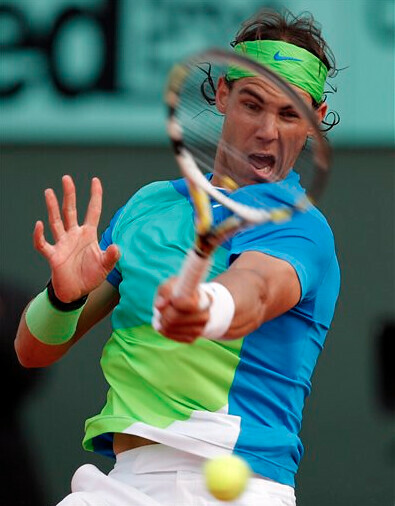 Last year, he was undefeated at 22 matches on clay — including his fifth French Open crown. I love watching concerts. From Don Moen to Duran Duran to Dionne Warwick (ha-ha, just kidding on the last one; I’m not as old as my mom! ), I’ve seen plenty. There’s one concert I strongly endorse you attend. It’s Monday next week (Dec. 6) and it’s called The GIFT OF LIFE Chorale Concert and Benefit Gala. Featuring four university choirs—from USC, UC, SWU and UV—the audience will be serenaded with Christmas carols and Cebuano favorites. Best of all, all proceeds will go to a most-worthy cause: to help “blue babies” (children with congenital heart diseases). Organized by the illustrious Rotary Club of Cebu and headed by President Joe Soberano, the ticket costs only P1,000 per person—with free dinner. Please watch. Listen to beautiful voices. Give the gift of life. That’s Dec. 6 at the Waterfront. See you there! ASIAN GAMES. Our continent is the world’s biggest and most populated. We are about four billion-strong comprising 60 percent of the earth’s people. For two weeks ending last weekend, our continent staged the once-every-four-years sporting meet called the Asian Games. How did our Philippines do? If you ask our three gold medalists — Dennis Orcollo of billiards, Rey Saludar of boxing, and Biboy Rivera of bowling — the answer is obvious: Gold is the most precious metal… and medal. But, as a whole, “PHL” failed. Of the 476 events representing 42 sports, we achieved a 3-4-9 score-sheet. That’s three golds, four silvers and nine bronzes for 16 medals. Given that we sent 188 athletes, that’s an impoverished finish. We scored an “F” or failure. This is worse than the Doha, Qatar Games of 2006 when we scored 4-6-9. This pales in comparison to Busan, South Korea in 2002 when we won 3-7-16. We are getting worse. The reason? As we progress slowly, our Asian neighbors are sprinting rapidly. Take the Chinese. They’re not only dominating the Asian Games (scoring 199 gold medals, the most-ever by a country) but even topping the Olympics, besting the Americans in total medals won. Of course, their population reaches 1.33 billion. Still, they surge while we languish. What’s most pathetic is this: we never saw TV footages of the Asian Games. 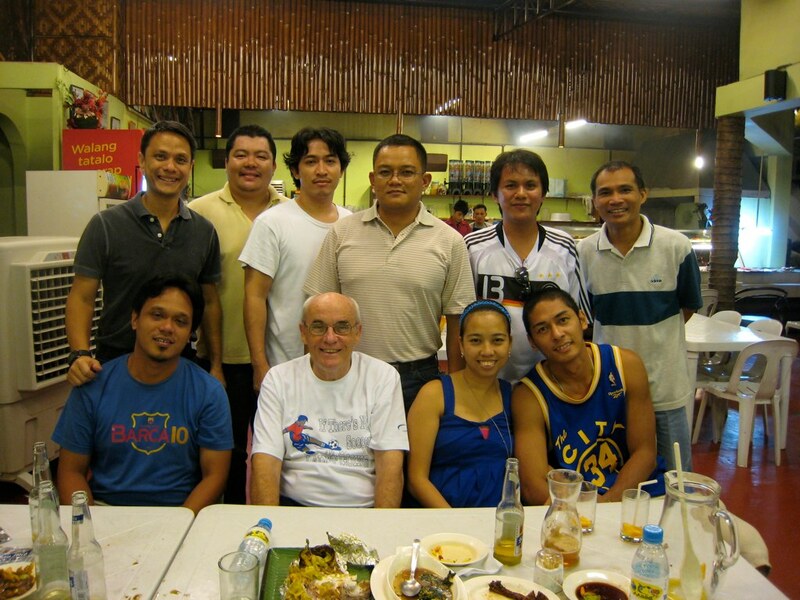 The least our local networks could have done was air the Opening and Closing ceremonies—plus games of the Pinoys. There was none. We lost in China. We lost at home. ROGER BEATS RAFA. This 2010, Mr. Nadal won three of the four Grand Slam titles: the French Open, Wimbledon and the U.S. Open. Mr. Federer did not win any. But, at the finale event of this season, he sought revenge. Roger defeated the world’s No.1 in this year’s last official big-time ATP match: the championship of the ATP World Tour Finals. What does this mean? Plenty. One, it means Roger—who was trailing 14-7 in their head-to-head prior to last Sunday’s match—will gain confidence. This means RF is not bygone, past-his-prime. It means heading into 2011, he still has the game to win—going undefeated in this round-robin format event. Two, this reaffirms the dominance of both R & R. They have combined to win 21 of the last 23 majors—a fantastic statistic. This rivalry will continue. The sad part? Like the Games of Asia, there was no Star Sports or Balls Channel TV showing. Not in this event; not the entire year with Masters Series tournaments. This was a missed opportunity for all tennis lovers. UC VS. ATENEO. Today is an important day for collegiate basketball. It’s Cebu against Manila. It’s Junemar Fajardo, the 6-foot-10 giant from Pinamungajan, who will lead the University of Cebu Webmasters against the Ateneo De Manila University Blue Eagles. On paper, it’s a mismatch. Ateneo is seasoned and is the three-time defending UAAP champions. They’re playing on home soil, in Manila. Their cheerers and blue pompoms are aplenty. But, as the cliche goes, “the ball is round.” Anything can happen in the semifinal of the Phil. Collegiate Champions League. If UC upsets ADMU, it will be historic; a win for the taga-probinsya. The word is Tenacity. It means to be persevering and dogged. The word is Determined. It’s defined as being “forceful, single-minded.” The word is Competitive. It translates to one’s being “merciless.. aggressive.. brutal.” All these words are synonyms to one name: Rafael Nadal. Has there been an athlete as forceful? And fist-pumping, Vamos-shouting, I’m-willing-to-die-on-court-to-win persistent? Yes, Michael Jordan was intense. So was Mr. Armstrong during his Tour de Lance. KB24 is another. And, we can point to our own: Manny P. They are history’s most strong-willed of sportsmen. Add two more letters to the shortlist: R.N. You want to know Rafa’s secret? Actually, there is no secret. We’ve seen it on our TV screens ever since he won the 2005 French Open (on his first try) as a 19-year-old. It’s called attitude. Mental strength. That’s it. For while nobody in the ATP Tour possesses a more Herculean build, it’s more than biceps and triceps that enable Rafa to win: it’s brain power. Nobody, simply put, wants it more. The U.S. Open final against Novak Djokovic? Well, the Serbian was handed plenty of favors. After a draining five-set upset of Roger Federer, Novak was scheduled to play Rafa just 20 hours later. It rained. He was given an extra 24 hours. Plus, during the final itself and while showing early signs of fatigue, it rained in the second set. Novak rested. It didn’t matter. Well-rested or not, there was no stopping the 2008 Olympic gold medalist from claiming his first gold in New York. Take the luncheon I joined two months ago. British Consul Moya Jackson, although nearer in hometown to Andy Murray, adores Roger Federer. Same with Michelle So. And Chinggay Utzurrum. Regardless of whatever Rafa accomplishes—even if he wins Major No. 155—their hearts are forever transfixed on Roger. Frank Malilong, one of this island’s best debaters and a left-hander with wicked topspin shots, is, on the other camp, a Nadal devotee. They argued. Teased one another. Everybody left Casino Español with stomach pains—not from sumptuous-food overload—but from laughing. Nobody admitted their R was weaker. It’s the same elsewhere. Bobby Lozada, Ernie Delco and Fabby Borromeo are for Rafa; so are my Jasmin and Jana. The Polotans—Jourdan and Jingle—are for Roger; so are Emma Siao and “R” doctors Ronnie Medalle and Ronald Eullaran. This debate is two-sided. But, you ask, won’t Roger also win more and add to his 16? Maybe; maybe not. Sure, Roger is still a threat. Had he converted on those match points in the semis, he’d have faced (yet, I believe, still lost to) Nadal. 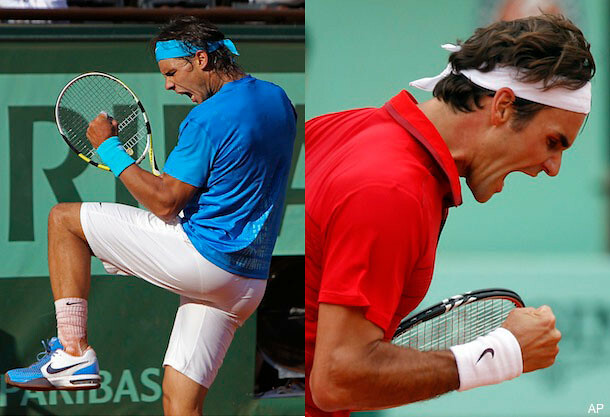 But here’s Roger’s problem: When facing the Spanish matador, his muscles melt like Swiss cheese. Their record is a lopsided 14-7 (in Nadal’s favor) and—here’s the more telling score—RF has lost six of their last seven meetings and has not beaten RN in a major since ‘007. Still, it’s a long way to go. But with Frank Malilong as his lawyer, I wouldn’t bet against Rafa. NY will have to wait another year… but will it happen ever? It is 9am here and the news is just through that the rivalry of R&R will be on hold for another Grand Slam. So will Rafa open his Open account in New York and claim the biggest apple they have for tennis there. If Rafa will win I suppose the inevitable of will he overtake Roger in the number of Open wins in the future will be ignited again. Rafa is clearly several rungs above the pretenders. Djokovic and Murray have not rattled the cage consistently enough to believe that Rafa would be troubled in the majority of games he plays against them. Only Roger we believe will give us a classic match. 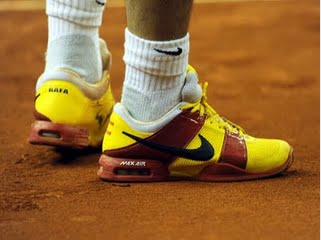 But given Rafa’s record (14-7) against Roger would he be shaking in his nike tennis shoes? Again the debate of whether there are chinks beginning to appear in the armor of Roger’s invincibility will again be ignited after this weekend. Only time will tell if Roger has won his last Open tournament. Rafa (with age on his side and if he stays fit) will be as relentless as he is in his games in his pursuit of Roger’s record number of Open’s wins. But the indisputable fact will be that for those lucky enough to have witnessed both Roger and Rafa during their careers, there will be debates (another one?) as to who is the GOAT or would there be a consensus to call them co-GOATS. I think if Rafa does eventually equal or gets near either way there would be a compelling case as they are so unique in their techniques and have brought so much theater to tennis. Interesting times ahead both on and off the court John. Now given my terrible tipping record I have most probably put the hex on Rafa and Djokovic will blow him away, but I wouldn’t bet on that either. Next to Manny Pacquiao, the two athletes I write about most often on these back pages are 6-foot-1, Nike-bandana-wearing twins: Rafael Nadal and Roger Federer. “The Open is the only Slam where Federer and Nadal have never played,” wrote Steve Tignor in “Is It Sunday Yet?” That’s true. 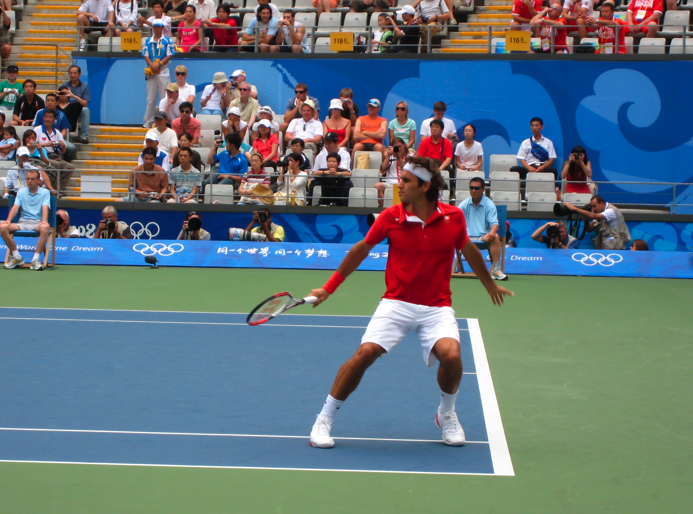 While the pairing have played 21 times, they’ve never faced each other in Flushing Meadows. We hope so. For, these friends have won plenty: Roger has six Wimbledon titles, four Australian Opens, one French and five US Open crowns while Rafa has five in Paris, two Wimbledons, one Aussie Open—but zero in NYC. Talking of major/major, that’s 16 for Roger and 8 for Rafa. 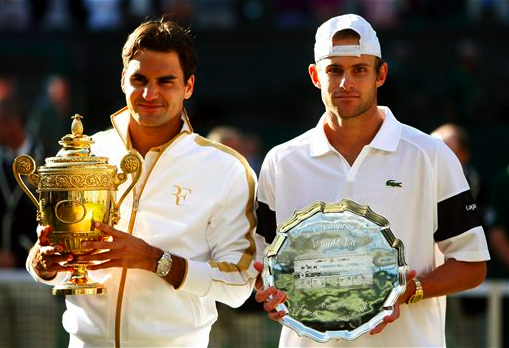 “I won the other three Grand Slams rather quickly, like he did,” said Federer. “The only difference so far is that I lost two (French Open) finals before, plus a semifinal, whereas he’s never been in a final here. Will this shot be this weekend? If Rafa does meet then defeat Roger, the 24-year-old will achieve a feat similar in magnitude to Spain’s World Cup victory: He’d become the youngest player in the Open Era to complete the career Grand Slam. Yet, while Rafa is hungry for this missing Big Apple bite, on paper, it’s the Swiss who’s favored. The reason: the past seven years, he’s won every match at the Open except one hiccup last year against del Potro. Mr. Federer possesses the most complete arsenal of weapons on a rectangle since tennis was spelled tenez. And this event’s hard court (DecoTurf) surface suits a player who carries more ammunition. So, here’s the intriguing question: While many don’t argue calling RF as the GOAT (Greatest Of All Time), if he loses to RN, would that tarnish his golden stature? If this final—said Mats Wilander: “I think it’s the biggest match of all time”—does materialize, here are factors to watch for: a) How potent is Rafa’s newfound, 135-mph serve? b) Who will the wind affect more? Thus far, Roger’s been better, c) Can Rafa continue his my-forehand-to-Roger’s-backhand tactic? d) Roger’s drop-shot surprise: will it be effective? e) The mental battle—will Rafa once more have the edge? These are my questions. Want the answer? Don’t miss the fight (RP time) tomorrow, Monday, starting 4 a.m.
Tennis player or not, this week and the next you’ve got to watch. Like boxing, it’s one on one. Like chess, no coaches are permitted. Like badminton, it’s just the net standing between you and your enemy. That’s tennis. 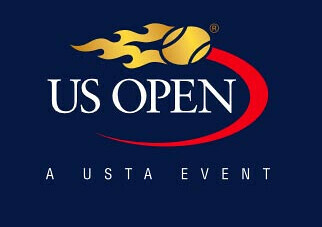 And, beginning yesterday until next Sunday, every night on our TV screens (Balls channel for my SkyCable) it will be the 2010 United States Open. 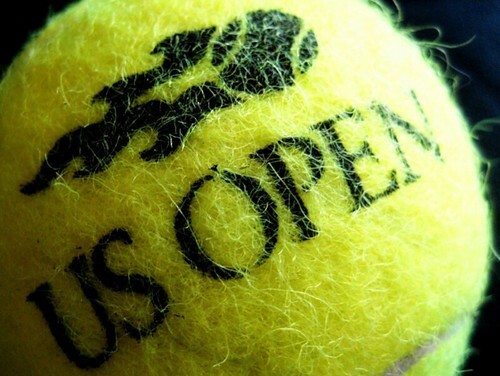 Of the four tennis Grand Slam events, the U.S. Open is the only one I’ve watched. Live. That moment was a long time back—11 Augusts ago—but it’s a memory that will forever be embedded in my brain’s Seagate hard drive. The U.S. Tennis Open, like many things American, is boisterous, intense, screaming loud and, with 1.7 million dollars to the men’s and women’s singles champions, loaded with $$$. Unlike Paris where the court surface is red or at Wimbledon where it’s green grass or Down Under in Melbourne where the atmosphere is shirt-less-relaxed, at this Open it’s New York City—the most energetic metropolis on Planet Earth. Tennis is easy to understand. Though the scoring, at first, is puzzling, it’s not as complicated as, say, the NFL or cricket. Tennis celebrates both women and men. Think about this important point: How many sports glorify women and give them equal billing? Basketball? Football? Boxing? Baseball? Nah. In tennis, women are equals—in prize money, in scheduling, in most-everything. At times, as in the case of one Maria Sharapova, she’s more photographed than Ivo Karlovic. Reason No. 3 why this game is loved: Tennis is individual. Single stars become superstars. Tennis is mano-a-mano; One vs. One. While most of the sports revolve around teams, in tennis (excluding doubles), it’s Serena vs. Venus, R & R, Clijsters against Henin, Borg-McEnroe, The Pete and Andre Show. Like American Idol, one winner—not one team of 12—emerges as champion. Like the Academy Awards, there’s only one Best Actor—the same with this U.S. Open, only one Best Player will carry that metallic trophy on Sept. 12. Among the men… Will Andy Murray finally win one for Great Britain? Two weeks ago, he beat Roger F. in the event name for the Swiss—Rogers Cup. I won’t be surprised if the 6-foot-3 Scot wins in NYC. Rafael Nadal? Though he’s performed subpar the past month (losing to Baghdatis), let’s not forget this fact: RN won the last two Grand Slam titles. Plus, he’s hungry for a New York cheeseburger. Already owning eight Majors, the only Big One he hasn’t digested is the Big Apple. But, perplexing to many because he’s won both on the slowest of surfaces (clay) and the fastest (Wimbledon), we ask why he can’t win more at the medium-paced hard-court. To which I reply: because the hard-court, as its first name explains, is hard. By “hard,” meaning the surface is rocklike and stiff—the worst type for Rafa’s 24-year-old knees. How about the GOAT? Can the man universally-acknowledged as the “Greatest Of All Time” win his sixth Open? Based on statistics, the answer is more than “Yes;” it’s “How-Dare-You-Pick-Anybody-Else-But-Roger.” For, if we study history, not only has this father of twins won five of the last six NYC trophies, but Federer’s triumphed in 41 of his last 42 matches there. 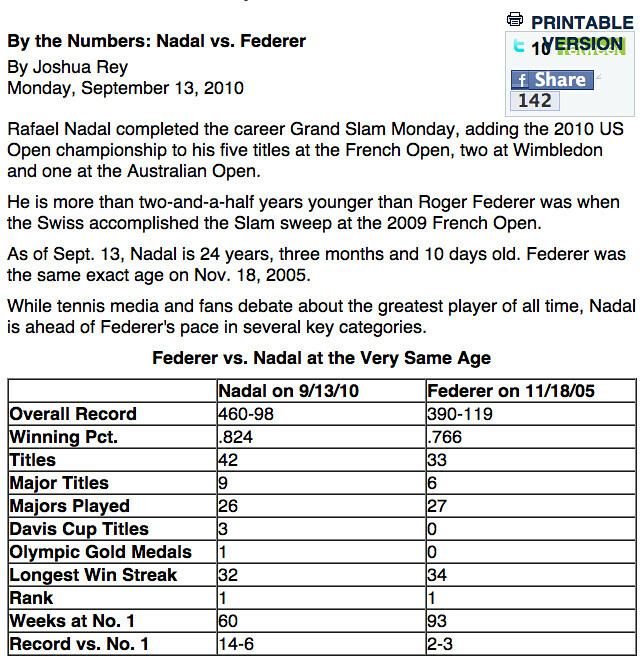 Which brings me to the asterisk attached to Roger’s resume: his record against Rafa. It’s 14-7 in favor of the Spaniard. Nadal has won six of their last seven sword-fights and their past three Grand Slam finals. Which makes their final showdown a perfect “New York, New York” ending, right? Thanks to Graeme Mackinnon for letting me know about this. Unbelievable! And it looks real. 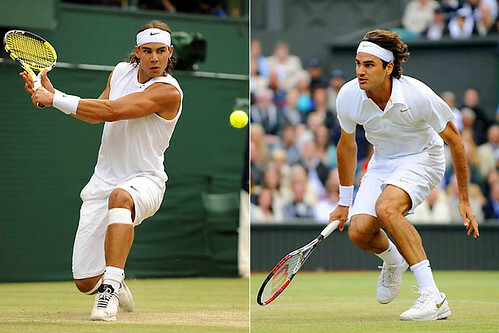 Only four men are left in the men’s draw of the 2010 French Open. Robin Soderling and Thomas Berdych occupy the upper half; if the odds are followed, Rafael Nadal and Novak Djokovic, who brawled against opposing players last night, will meet in the other semifinals. Looking ahead to this Sunday, it’s expected to be another R & R finale. Only this time, the reigning Roland Garros winner codenamed “FED” will be missing. What a match the duo played two nights ago. I hope you saw it. In the first set, Federer was impeccable. He won 6-3. In Set 2, he was broken in his first service game, trailed 2-0, then promptly lost 3-6 to Mr. Soderling. In the third set, Roger owned a set point against Robin with the score, 5-4, but—in what turned out to be the point of the match—his opponent saved that game. At 5-all, it rained in Paris. I slept in Cebu. It was nearly midnight. Then, my text-mate that evening, Sun.Star’s Executive Editor Michelle So, sent me a message that my phone captured at 1:48 a.m. Reading it when I awoke at 5:37 yesterday morning, the message was succinct: “RF lost. 6-3, 3-6, 5-7, 4-6.” My guess is, Michelle, the leader of the RF Fans Club of Cebu, if ever there was a group, had trouble sleeping after RF’s exit in France. But what a performance by this Swede nicknamed Soderking. (True: He sawed-off ‘d King.) Robin slammed the ball from his slingshot forehand to Roger’s backhand, drilled a down-the-line backhand, served a 240-kph ace, he played fearless, never, for a moment, intimidated thinking that across the net was The Greatest Of All Time. Peter Bodo, in his blog at Tennis.Com and a story he titled, “K.I.S.S. Revised” (the KISS stands for Keep It Simple, Soderling), added: “The main difference, in the big picture, was that Soderling reached out aggressively to take the match, and he did that from start to finish. Meanwhile, Federer did a fair impersonation of Hamlet, his game fading in and out like the signal from a distant radio. More and more, it looks as if Federer is not really playing to win, the way a Soderling is in these upward arcing days of his career. “It seems that Federer is playing not to lose. He’s doing a fair job of that, hanging in, fending off, snarling and snapping like a captive wolf in a cage. But Federer doesn’t seem to seek the freedom represented by victory, or triumph over his captors and adversaries. He doesn’t appear to want to attack, break through, run like the wind and distance himself from his tormentors. The final question, of course, is this: Who will win on Sunday? If Robin meets Rafa, can last year’s tormentor, who inflicted RN’s first-ever loss at the French Open, win again? Given his thrashing of Roger, will Soderling’s all-power assault once more punish Nadal? Consider that the 6-foot-4 Robin is at his all-time peak in world ranking (No.7) and confidence. Or will Rafa, now fully-healed of injuries and having won three Masters Series clay-court events leading to Paris, avenge his 2009 loss to Robin? The answer—like the Lakers vs. Celtics dispute—is coming soon. The year was 1999. That was 11 long years ago. Yet, when I look back at that singular moment–at those few precious seconds–when I got to shake the hand and pose for a photo with an all-time tennis great, the flashback rouses my face to smile. It was the U.S. Open. Not your ordinary tournament, it was the rowdiest and largest Grand Slam event on this planet. My dad Bunny and I watched the full two weeks, each night and day absorbing an overload of forehands and backhands. On the first evening–on August 23, 1999–we trooped to the Louis Armstrong Stadium for the Opening Ceremony. We were energized. This was New York City. Then, minutes before the start, a small commotion startled the audience. He entered. “He” happens to be the only player in mankind to have won all four Grand Slam titles (in Australia, France and the U.S., plus Wimbledon) in the same year… twice. Wearing a green coat-and-tie with a red necklace strap hanging on his neck, his blonde hair was disheveled and his white cheeks glowed pink. Acting quickly, I climbed the steps then waited for that precise opening when I approached from the side, introduced myself as Filipino, then asked for that one-click-I’ll-never-forget-this moment as my dad snapped the photo. No, he’s not Roger ‘Federer Express’ nor is he ‘Pistol Pete’ Sampras. He’s not Agassi or Becker or Borg or McEnroe. In fact, if you’ve followed tennis as I have–starting the 1980s–his name might not be all-too-famous. But if you know the game’s history, you know him. Even better, if you watch today’s Australian Open, then you’ve seen his name plastered on the TV screen. Rodney George Laver. Nicknamed “The Rocket” because of his explosive style and named after his hometown of Rockhampton, Queensland, he’s the reason why that August ’99 moment I’ll always cherish. 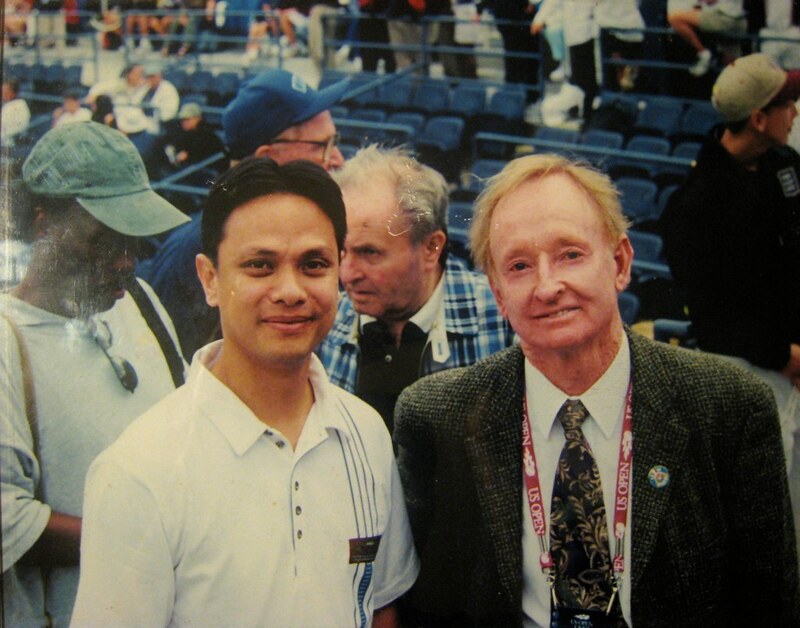 For Rod Laver stood–figuratively–tallest among the giants of the sport when, in fact, he’s only 5-foot-8 1/2 tall. In this era of Juan Martin del Potro (6’6”) and Ivo Karlovic (6’10”), he’s minuscule. Add to the equation his weight (145 lbs.) then you have a “pocket-sized” player. Yet, he’s a rocket. For, in his prime, he possessed a game as complete as Federer’s today. For “Rod Laver” is the synonym of “Grand Slam,” which means winning the four majors in the same year. Take Federer: though he’s won all four majors, he did not achieve this feat in the same calendar year. Only four others have accomplished the real Grand Slam, and each achieved it only once: Don Budge (1938), Maureen Connolly Brinker (1953), Margaret Court (1970) and Steffi Graf (1988). The Rocket did this twice, in 1962 and 1969. Sounds like Federer, right? Yes. But with a difference: Laver is left-handed. Which means he has the all-around, no-weaknesses armada of Roger plus the lefty serves and lefty topspin style of Rafael Nadal. Imagine morphing these two to form one? That’s Rod Laver. The coming week or so will not only be the last 11 days of December, they will also be the remaining moments of 2009 and–even more significant–the last 11 days of the past 120 months of this decade. Starting with the year 2000, here we are, less than two weeks away from the end of the decade—the first 10 years of the new millennium. And so, we celebrate. We highlight the outstanding achievements of the past 10 years. To me, few can surpass the triumphs of this Swiss who can fluently speak German, English and French. Today, he stands 6-foot-1—and stands as the player who has the tallest of rankings: No.1. For he has amassed just about every laurel there is in tennis. Grand Slam singles titles? He’s collected 15. Previously, the record-holder was Pete Sampras, who totaled 14—a number that plenty (including myself) thought was unlikely to be surpassed. Yet barely a few years had passed after Sampras’ retirement had his close buddy winning all the slams on this planet. That’s true, Pete. For here are the numbers… Wimbledon? 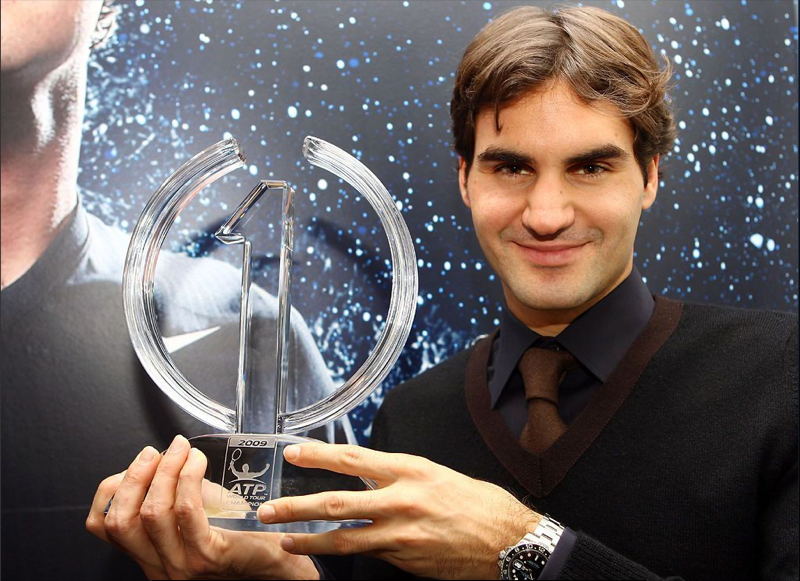 Roger won six: from 2003 to 2007 and, last July, in 2009. US Open? Federer has five wins in New York, from 2004 to 2008. 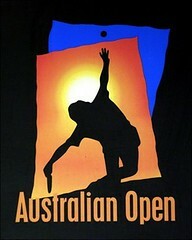 Australian Open? He’s grabbed three—in 2004, 2006 and 2007. French Open? Ahh. This is special. For this tournament, because of it’s slow red clay surface, is often dubbed “the most backbreaking event in tennis.” Last May, while Rafael Nadal lost early in Paris, RF collected his most precious memento ever in Roland Garros. That’s 15 majors. More than Sampras. More than Bjorn Borg. More than anyone else who’s ever carried a tennis racquet. More than Tiger Woods. The man adjudged by the Associated Press as the “Athlete of the Decade” (and Disgrace of the Year?) has 14 major titles. Well, shouldn’t the Athlete of the Decade prize instead have gone to RF instead of TW? That’s another story—and article. But this fact is true: Thus far, Roger beats Tiger with 15 vs. 14. Plus, isn’t Tiger taking an indefinite leave while Roger, at age 28, is still at his peak? More statistics to cement RF’s status as the GOAT (Greatest Of All Time) in tennis? He stayed at the No.1 spot for 237 consecutive weeks, a record. He’s reached 22 straight Grand Slam semi-finals, a record. He’s been in 21 Grand Slam singles finals—and 17 of the last 18, a record. Is there any other record that he has yet to break? Well-said, Andre. 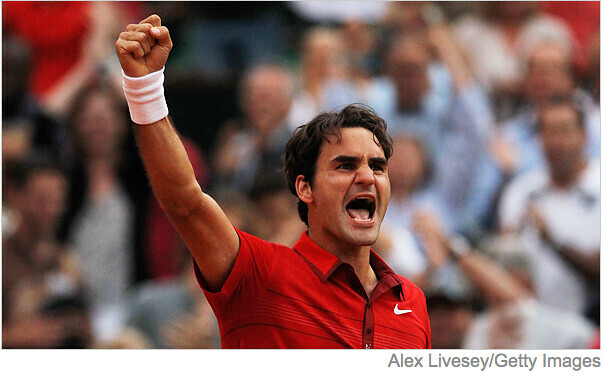 For Roger’s successes go beyond just piling up victories. It’s his manner of play. His effortless motion. His grace. His movement that sees him floating. His serve. His forehand. His volleys. Every aspect of his game is A+. From a personal standpoint, I consider myself lucky. Twice, I had a chance to watch Federer in person. In August of last year, I saw him win the Olympic gold medal in men’s doubles. 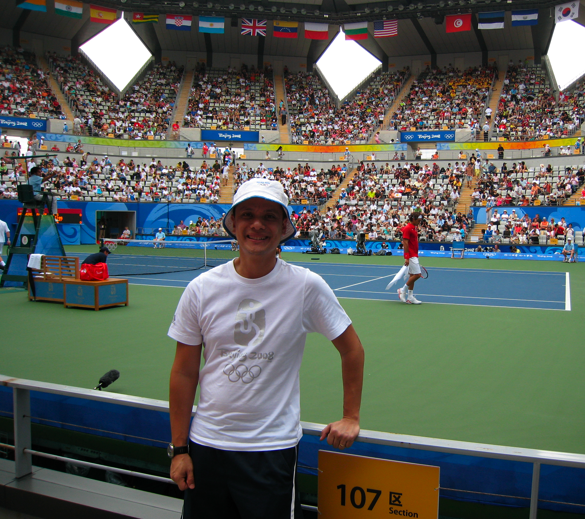 And, in Kuala Lumpur back in 2007, and accompanied by several from Cebu that included two of Roger’s most passionate of fans, Michelle So and Chinggay Utzurrum, we watched Federer vs. Sampras. But here’s my “mistake.” The day before their exhibition match, in a meet-and-greet session with Malaysia’s elite, I sneaked my way on stage to be near Roger and Pete. But given only a few seconds and the choice to shake one player’s hand, I turned to Pete. Now the Greatest Ever, I should have picked Roger. What a rollercoaster season for the Spanish superstar. First, he began in perfect form: At the Australian Open, the year’s first Grand Slam event, Rafael Nadal reached the semifinals not having lost a set. Meeting his fellow Spaniard/lefty Fernando Verdasco, they engaged not in a tennis game but in a bloody slugfest of boxing: a five-setter that concluded as the longest match in Oz Open history at 5 hours, 14 minutes. Nadal won. In the finals against—nobody, nobody but…—Roger Federer, it was another classic battle. Rafa prevailed in five sets and was crowned the Australian Open victor. He was superb, impeccable, splendid. Then………… Bang! The collapse started. 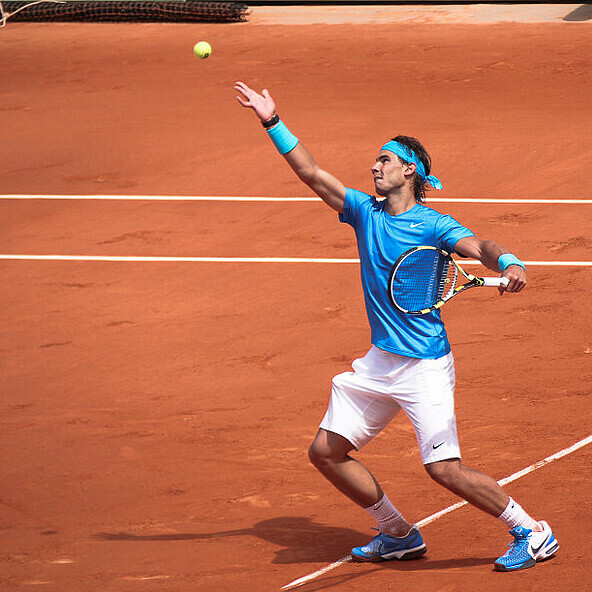 At the tournament where he has never lost, on the red clay of the French Open, Rafa was the four-time defending champion. 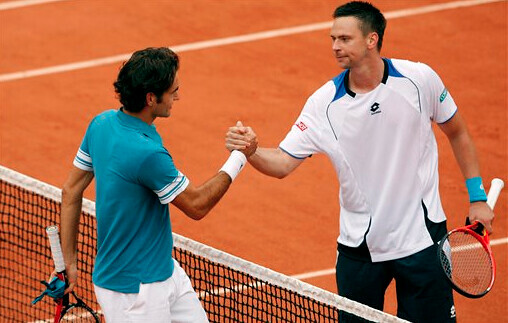 Until he met Robin Soderling in the fourth round—and was beaten. On that May 31 afternoon, Nadal did not only lose the match, he lost much more: his confidence. His topspin. His knees. Suffering from tendinitis, he later withdrew from the most prestigious tennis party on earth, Wimbledon. Nadal rested for two months. But the damage was done. He was vulnerable. He was no longer Rafa The Invincible. When he returned in August, he promptly lost to Juan Martin Del Potro. Worse, he surrendered the No. 2 ranking (a spot he had held since July 2005) to Andy Murray. Next, at the US Open, once more RN was obliterated by the 6-foot-6 Argentine named Del Potro, 2-6, 2-6, 2-6. Bad. But here’s worse: At the year-ending ATP World Tour Finals, Nadal played three round-robin matches. His score: 0-3. Not a single match did he win. In fact, RN did not win a single set! Even worst than worse—if there’s ever such a term—Nadal lost his last four matches and lost his last eight sets of tennis. For didn’t Rafa win the 2008 Olympic gold medal? Wimbledon last year? And the world No.1 ranking? And now, he’s wobbled, stumbled, and faltered? Can he recover? Or has the all-too-physical game of Spain’s muscleman finally damaged his body? Can he retain the No.1 crown and ward off not only Federer but the likes of Murray, Djokovic, Del Potro, Tsonga? Relax, relax. Nadal, lest we forget, is so much younger than me and, mostly likely, you. He’s only 23. So he’ll recuperate. He’ll reconfigure his game for his body to take less beating. He’ll win the US Open. He won’t disappear. Proof of his resurgence happened over the weekend. At the Davis Cup, Nadal won the crucial first game against the Czech Republic player, Tomas Berdych, 7-5, 6-0, 6-2. And, in the finale match, he won again. With those wins, it brought his DC record to an extraordinary 14-1. (No thanks to lousy cable TV coverage, we didn’t see those matches.) 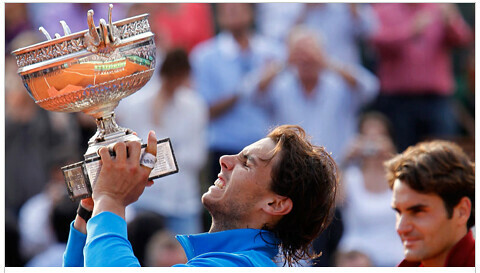 By week’s end, Nadal and Team España captured the Davis Cup. Was that significant? To Rafa? Absolutely. Because looking back at his story, in 2004, RN’s tennis career was launched when, as an 18-year-old, he beat Andy Roddick in the Davis Cup final against USA. Since then, he has zoomed to the top. The following year, Rafa won the French Open and jumped from a ranking of 51 to world No. 2 by the end of 2005. Davis Cup recharges Nadal. And, my guess is, never mind his painful defeats in Roland Garros and the US Open and his exit from Wimbledon—plus the shocking divorce of his parents, Sebastian and Ana Maria, in the middle of the year—all these painful memories have been erased after he raised the Davis Cup trophy. Because with Nadal, it’s mental. It’s hard to find a tougher, more tenacious and first-class and paramount athlete than Rafa. Except one…. Tiger Woods? Ha-ha. That’s before last week. It’s the US Open! What’s my biggest tennis wish? That two 6-foot-1 Nike endorsers will meet in the finals. 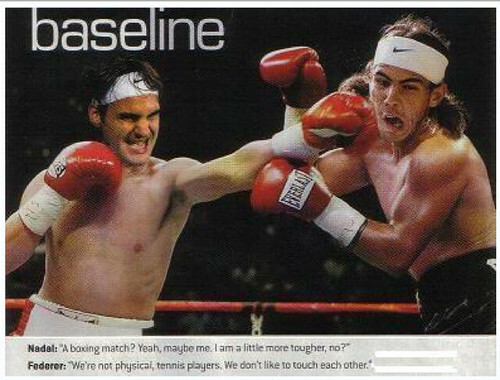 You see, every time Roger Federer and Rafael Nadal meet, it’s like a Pacquiao-Mayweather fight. It’s like the Lakers vs. Celtics, the Yankees vs. Red Sox, La Salle against Ateneo. It’s a blockbuster movie. Only this time, it’s not reel but for real. If you’re a Roger Federer fan, you’ve got to read this excellent piece by the New York Times’ Christopher Clarey. Roger Federer’s favorite color is gold. His large bag glitters that color. If you examine his tennis shoes, gold is laced all around them. Same with his T-shirt and its trimmings, including the Nike swoosh and the inscription, “RF.” More so with his pre-match jacket and long pants. All trimmed with gold. Fittingly, when the Wimbledon finale that needed more games than any other Grand Slam final was over, he carried on his fingers the trophy that glimmered with one color: Gold.